Following the disaster of wildfires at which 91 people lost their lives in Greece, the CPs around the world issued messages of solidarity with the Greek people and the Communist Party of Greece-KKE. (TKP, PC Italy, PdA, WPI, NKPJ) To be updated. Communist and Workers' Parties, all around the World released statements regarding the devastating fire disaster , expressing their solidarity with the Greek people and the Communist Party of Greece (KKE). "We call on all our friends and comrades to stand with the Greek people! 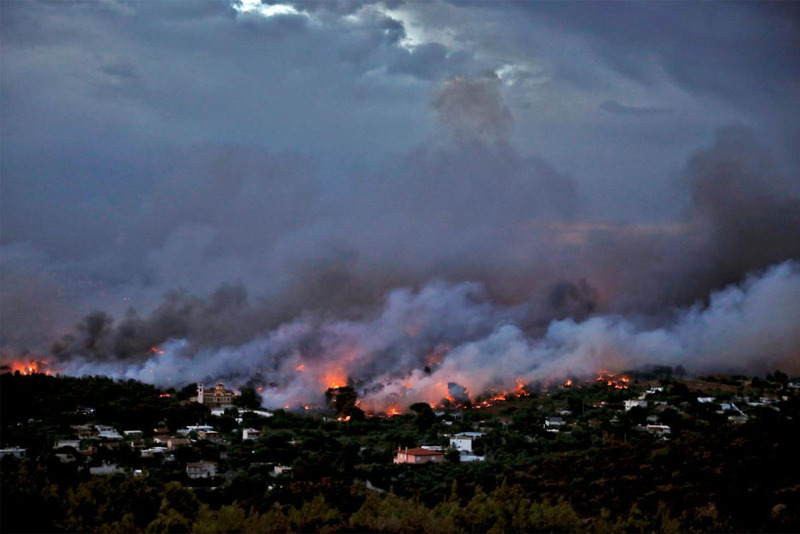 In our neighbour country Greece, a wildfire has taken dozens of lives, hundreds of have been affected and wounded by the worst disaster in the last decade. Despite the tremendous efforts, the fire is still continuing and the number of people losing their lives is increasing. Although the state authorities claim that the fire might have been started by some people with evil intentions, we have the experience from our country that in similar disasters, this such unproven claims are used to moderate peoples’ reaction. We don’t yet have confirmed information on how the fire occurred. Yet regardless of what happened, we cannot ignore the fact that the established order remains an open door to such tragedies. It is now a very familiar scenario for the peoples of both countries that the wildfires are “employed” to turn public lands and properties unusable in favor of rents of capitalists. Meanwhile, necessary precautions to avoid such disasters are abandoned for the sake of the capital’s greed for profit and because that the state is no longer shouldering its responsibility to protect its citizens. As we have seen very recently in the railway disaster in Turkey, lives of human beings come to their minds only in cases of emergency. It is mandatory in this wildfire to identify with full clarity all the untaken and neglected measures. We share the great sorrow of Greek people, and declare that we are ready and eager to help and support in the recovery process by all means. We call on all our friends and comrades to stand with the people of Greece in this hard time. "The Communist Party (Italy) expresses its full support and solidarity with the Greek people and our sister party KKE. We send our respects and sincere condolences to the families of dozens of deceased victims of the Attica region. We know that these dramatic events are not only the consequences of an exceptional event and are preventable. We deeply believe that tthis is the consequences of the lack of an effective national civil defense plan and that it is closely related to the lack of timely intervention. All the bourgeois states and their governments, regardless of their being left or right wing, do not implement an effective national protection plan because they see everything that they can not make as a "cost". On behalf of the Party of Labour of Austria (PdA), we would like to express our deep sorrow in the disaster and destruction caused by the fire in Greece and especially in Attica. PdA wants to offer substantial support to PAME's aid efforts to show the solidarity of its members and their friends. As the KKE rightly emphasizes, the real cause of the loss of many people is because the profits of the capitalists overwhelm the needs of the people and this is the responsibility of the bourgeois governments As is the case with all other issues, the SYRIZA-ANEL government continues and even aggravates the anti-public policies of previous governments. Given the development of the productive forces in the 21st century, such human losses are unforgivable and show that capitalism prevents the contemporary needs of the working class and its people from being met. The urgent intervention of PAME's class-oriented unions, as well as the KKE, is of value and importance in terms of uniting class cohesion in order to prevent and combat these kinds of situations in the future. We are also witnessing a comprehensive attitude of the KKE towards the social issues and needs ." On behalf of the New Communist Party of Yugoslavia, we sincerely convey our sincere feelings for the tragic outcome that hit you and caused many people to lose their lives. The scenes that we see are reminiscent of the doomsday scenes where our country is influenced in many ways by wars and natural disasters. You were with us at that moment when our people suffered, and we owe you a deep appreciation for it. We hope that you will support their loved ones in the lost and hope that the wounded will heal as soon as possible. Our members and friends will participate directly in the activities to help the people of Greece."